Iranian director Asghar Farhadi, best known for his award-winning features A Separation and The Salesman, has taken a new direction with his latest project Everybody Knows. 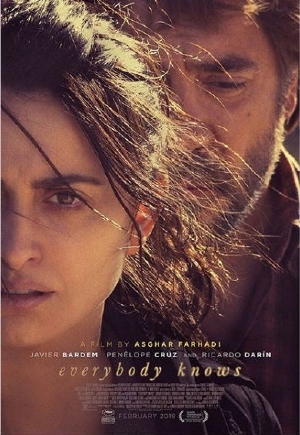 For starters, Farhadi moved production to Spain and though he's still credited as writer, the new film is in Spanish and starts three Spanish language superstars: Penélope Cruz, Javier Bardem and Ricardo Darín. Cruz is Laura, a woman living in Buenos Aires with her husband Alejandro (Darín). She returns to her childhood home with her children for her sister's wedding but the celebrations are thwarted when, on the night of the wedding, her daughter is kidnapped. Bardem plays Paco, an old flame who is somehow involved in this entire mess which, as the trailer suggests, may have roots in the trio's past. The newly minted trailer plays heavily into the mystery at the centre of the story which is promising as Farhadi has a knack for building tension and I expect, from what we've seen so far, that Everybody Knows will deliver the goods. Everybody Knows will open in February 2019.